This week: predicted to be in the 60's. The 60's! We live in Pennsylvania! And it is February! We are starting seeds everywhere..inside the hoophouse, in the basement, outside the hoophouse in open beds, and in beds with floating row covers on them. It is time to eat fresh from the garden again! But 60 degree days in February make me nervous. What are the bugs going to be like this summer?! How will we keep them at bay when we already see them here.. 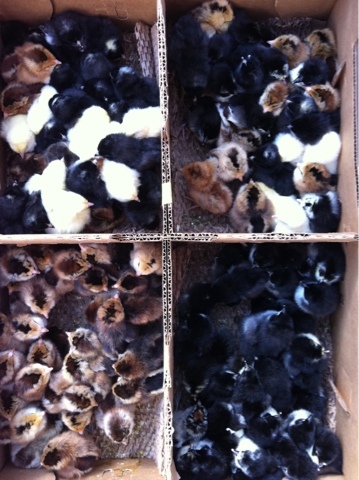 Meanwhile, the baby laying hens that arrived on the farm last November are growing, slowly. These old varieties take a long while to grow to maturity..which is the reason they are no longer grown in great quantity, egg producers want a quicker to mature, lay an egg a day, don't eat much variety and so they grow the new hybrid chickens. The girls here are lots of kinds so a carton of eggs from us means different colors, shapes and sizes of eggs. But all delicious!